I’m new to long-distance caregiving—what should I do first? Where can I find local resources for my family member? Get tips for caregivers to make doctor's appointments easier. Try to find people who live near your loved one and can provide a realistic view of what is going on. This may be your other parent. A social worker may be able to provide updates and help with making decisions. Many families schedule conference calls with doctors, the assisted living facility team, or nursing home staff so that several relatives can be in one conversation and get the same up-to-date information about health and progress. Learn about geriatric care managers and how they may be able to support you and your family in your role as caregivers. You might also check with local senior centers. 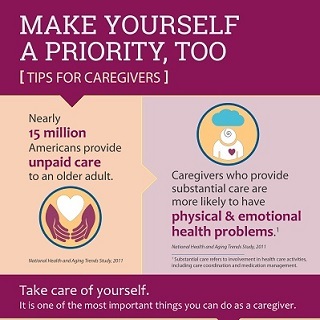 Learn more about long-distance caregiving. For a print copy of NIA's booklet on Long-Distance Caregiving: Twenty Questions and Answers, visit our publications ordering page.